To Sell Is Human offers a fresh look at the art and science of selling. 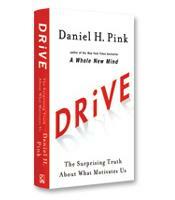 As he did in Drive and A Whole New Mind, Daniel Pink draws on a rich trove of social science for his counterintuitive insights. He reveals the new ABCs of moving others (it's no longer "Always Be Closing"), explains why extraverts don't make the best salespeople, and shows how giving people an "off-ramp" for their actions can matter more than actually changing their minds. 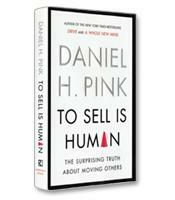 According to the Bureau of Labor Statistics, author Daniel Pink notes in his new book To Sell Is Human, 1 out of every 10 Americans works in sales. Is that less than before? Certainly. But have the Internet and online shopping brought the sales function to the precipice of extinction, as so many have predicted? Not quite, Pink writes. In fact, the Bureau of Labor Statistics data (replicated by corresponding statistics in other developed countries) vastly understates the amount of "selling" going on when we consider what selling, according to Pink, really entails: "persuading, influencing and convincing others." This is what he calls "non-sales selling." Most people, Pink explains, are involved in non-sales selling, no matter what their profession. Examples cited by Pink include physicians who sell patients on a remedy, lawyers who sell juries on a verdict, teachers who sell students on the value of paying attention in class, entrepreneurs selling to funders, writers selling to producers and coaches cajoling players to play their best. In fact, it’s no longer completely accurate to see producing and consuming as the two most important economic activities, Pink writes. "Today, much of what we do also seems to involve moving," he explains. "That is, we’re moving other people to part with resources — whether something tangible like cash or intangible like effort or attention — so that we both get what we want." 1. Entrepreneurship. The past few years (thanks in great part and a bit ironically to the Internet) have seen the rise of small entrepreneurship — small shops or one- or two-person enterprises selling, as Pink writes, "services, creativity and expertise." For these small-business owners and micro-entrepreneurs, there is no dedicated sales force to bring in the customers; they are their own sales forces. 2. Elasticity. Once upon a time, Pink writes, "if you were an accountant, you did accounting." However, intense competition and economic conditions have forced organizations to go "flat" — or at least flatter. As a result, functions are no longer rigidly separated as in the past. Job descriptions are broader and usually involve some kind of selling. 3. Ed-Med. Education and health are among the fastest-growing industries, and as the examples of the teachers and physicians above demonstrate, much of education- and health-related work involves non-sales selling. "Of course," Pink notes with characteristic humor, "teaching and healing aren’t the same as selling electrostatic carpet sweepers. The outcomes are different. A healthy and educated population is a public good, something that is valuable in its own right and from which we all benefit. A new carpet sweeper or gleaming Winnebago, not so much." When selling is mostly "moving" people, the old rules of selling no longer apply. After making his case for the predominance of non-sales selling in our lives, Pink outlines the different strategies for 21st-century selling. He begins, in the second section of his book, by showing how the traditional mantra of selling, "Always Be Closing," has been replaced by a new set of ABCs: Attunement, Buoyancy and Clarity. Attunement is to be in harmony with those around you — which is why, Pink writes, extraverts are not the best salespeople. They don’t take the time to become attuned. (Introverts aren’t necessarily the best, either, Pink notes.) Buoyancy is knowing how to always be "afloat" in a difficult world of constant rejection, thanks to one’s resilience and optimism. Clarity, in Pink’s approach, refers to the art of problem finding — different from the traditional emphasis on problem solving. Attunement, Buoyancy and Clarity are the attributes of the new successful salesperson. In the final section of the book, Pink outlines the three core abilities — knowing how to pitch, how to improvise and how to serve — required to succeed. 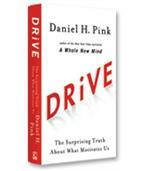 Pink, a best-selling author whose books include Drive and A Whole New Mind, has once again expanded his readers’ perspectives on how the world really works, with insight and humor bolstered by solid research.